Safe Streets, Safe City / Making Kansas City a safer city . . .
Making Kansas City a safer place to live, work and visit. Kansas City, MO homicide stats . . .
. . . how does KC compare? 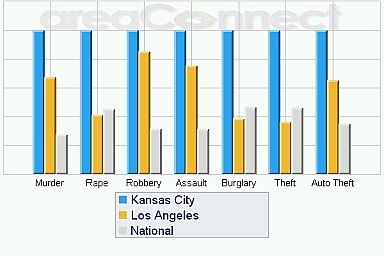 2005 homicide rate of Kansas City, Missouri compared to other metropolitan cities. For every 100,000 New Yorkers there are 6.36 homicides. 515 homicides in 2005. For Los Angels there are around 13 per 100,000. For Chicago there are 15 homicides per 100,000. For every 100,000 Kansas Citians there are 28.1 homicides. 127 homicides in 2005. The population of New York City is 8.1 million people. The population of Kansas City, Missouri is 451,500. Kansas City has nearly 4.5 times more homicides than New York City. KC is nearly if not double that for Chicago and Los Angles for 2005 homicides. Los Angeles and Chicago lower homicide rate then KC". . . most larger cities had significantly lower murder rates last year (2005). New York had about 7 murders for every 100,000 residents; Los Angeles had about 13, and Chicago had 15. Kansas City, MO was 28.1 per 100,000. Read article here. Kansas City, Missouri compared to United States of America on homicide rate for 2005. KC loses again! There were 12,658 homicides in the United States in 2005. Kansas City's was 127 for the year 2005. There are nearly 291,000,000 people living in the US. There are nearly 441,500 people living in Kansas City. For every 100,000 people living in the United States there are 4.35 homicides. Kansas City, Missouri is 6.46 times higher than the National homicide rate for 2005! So let's break it down to something simple. If the national homicide rate was like Kansas City then there would be 81,770 homicides in the US for 2005, instead of 12,658. Wow! What a difference. So by this reasoning we can conclude that if other city agencies across the U.S. were to adopt the same strategies, rules and governing efforts as Kansas City civic leaders, then there 'could' be an additional 69,211 homicides in the United States! Comparative crime ratios per 100,000 people. Kansas City is off the charts!